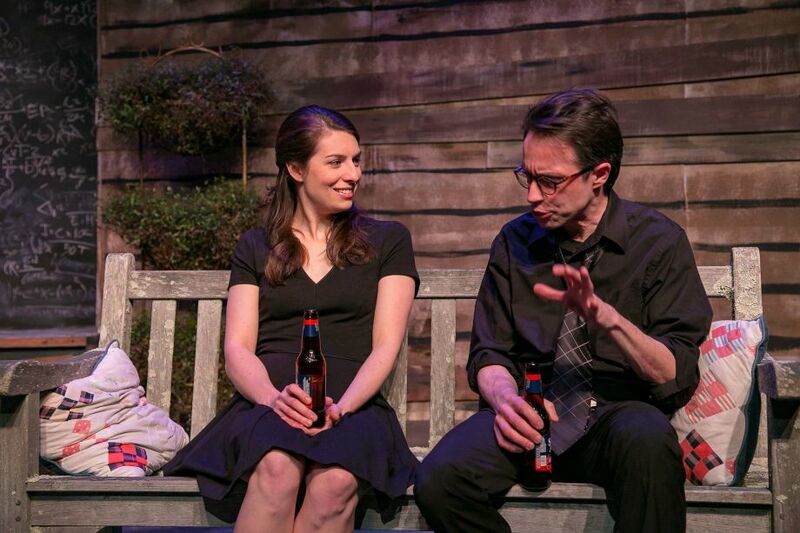 TheatreWorks’ Proof is Theatre at Its Best! 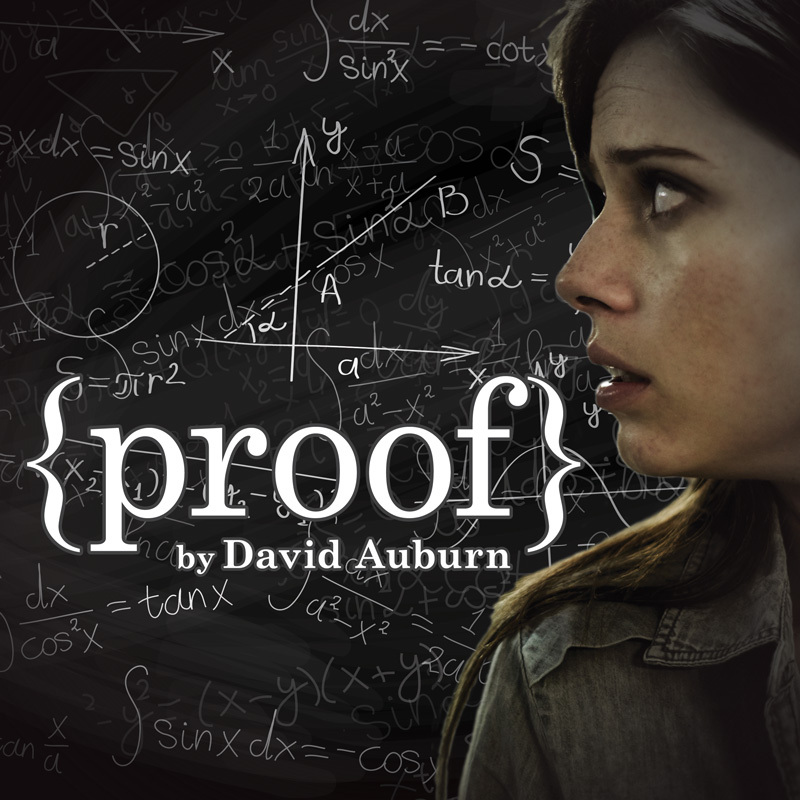 Proof is a brilliantly executed play where all the parts – casting, acting, direction, set design – add up to an electrifying and engaging theatrical experience. Indeed, in the jargon of cosmologists, astrophysicists, and mathematicians, TheatreWorks New Milford’s Proof is simply elegant in its design. The story by David Auburn centers on the father-daughter relationship between a brilliant, world-renowned but insane mathematician and his loyal, perhaps equally brilliant daughter who may have a predisposition to her father’s malady. Without giving away any spoilers, the significant subplot involves the identity of the author a of mathematical proof involving prime numbers which could revolutionize the field. When thinking about the story, imagine a primordial stew where the best elements of A Beautiful Mind, Good Will Hunting, Gifted, Relativity and even, to an extent, Doubt come together in a thought-provoking mash up. 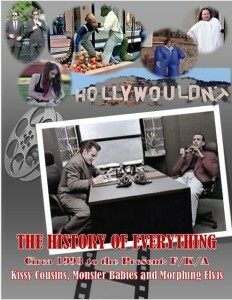 The acting is stunning, with all the actors portraying wide arcs and ranges with each of their characterizations. Anna Fagan (who Pillow Talking loved in Cat on a Hot Tin Roof) proves that she can easily go from portraying the sultry Maggie the Cat to the vulnerable, depressed Catherine in Proof. But despite the exterior veneer of her insecurities, Ms. Fagan is able to convincingly project an underlying core of strength and perseverance that are both vital to her finely nuanced performance. Viv Berger (who Pillow Talking enjoyed in Animal Farm) gives a wide-ranging, riveting performance as Robert, the world-famous mathematician. His performance captures and encapsulates one of the play’s principal themes – that the line between genius and insanity is often a slippery slope. Carey Van Hollen gives a wonderfully layered performance as the not-so-brilliant (she would not know a proof from a recipe), pragmatic, somewhat envious and self-absorbed older sister. Finally, Daniel Basiletti is pitch-perfect as the geeky but charismatic math maven, Hal. In another layered performance his charm is somewhat overshadowed by his ambition and his quest to find the next big thing in mathematics and win the Fields Medal. Despite the play’s heavily-laden dialogue, the pacing never drags or feels slow which is a result of the superb direction by Frank Arcaro. A focus on the subsidiary motif of gender equality in certain fields like math make the play more relevant today than when it was first developed eighteen years ago. Shout outs must also go to Jenny Andress (Scenic Painter) for a great set and Leif Smith (Lighting Design) for effective mood lighting. There is no doubt. TheatreWorks New Milford’s Proof is in the pudding: it has a winning formula that will resonate with modern audiences – and you don’t have to be good at math to enjoy it! The human brain is the most complex computing system imaginable and performs thousands of functions at any given moment – just one of which is reading this right now, albeit it is far from a “simple” task and utilizes multiple brain areas to accomplish it. Yet despite all of neuroscience’s understanding of this amazing organ, we still cannot fathom its intricacy and we likely never will. For most of us, we take this 3-pound, jelly-like, convoluted mass for granted in our day-to-day lives. It is just there, tucked securely inside our skulls, and it goes along doing its thing; but when we encounter something that is exceptional or unusual or when some function goes awry, it gives us reason to pause. These flubs or “mind bugs” as they are often called, could perhaps be an act as simple as forgetting someone’s name, or something darker and more serious, such as a stroke. But there is wonder and awe as well – take for instance, the work of a high-level mathematician. Those individuals who possess remarkable abilities and who excitedly engage with numbers in ways that make many of us groan. For them to do so, they must use a rather different and advanced neural circuitry, piecing together numbers and letters and functions like the most impressive and stunning orchestral maneuver. Now I happened to be one who actually loved math in school (I got As in college calculus! ), yet I am constantly floored at the feats of such math geniuses as John Nash, Albert Einstein, Stephen Hawking, and Alan Turing, to name just a few. I’ve also enjoyed such films as A Beautiful Mind, The Imitation Game, Good Will Hunting, The Theory of Everything, and Gifted. 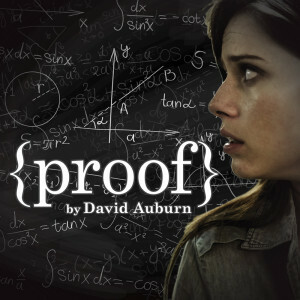 It is with this interest and curiosity that I recently went on to see playwright David Auburn’s dynamic Proof at TheatreWorks New Milford. And with same Wow! factor and brilliance of its cinematic peers, this production completely blew me away. The magic of Proof begins with a rich and beautiful text – Tony, Pulitzer, and New York Drama Critics Circle Award-winning – one which speaks to its audience, drawing them in, and it accomplishes this whether or not math is your game. 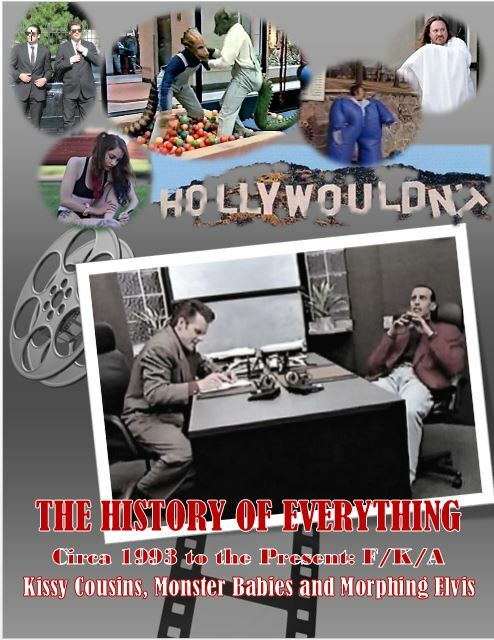 I’ve truly come to expect that all the productions by TheatreWorks are going to be of such caliber – plays that enrich their audience, bringing culture and intellectual fodder to their intimate space while also providing outstanding entertainment. Next, there is skillful direction by Frank Ancaro, who, in the same vein of the aforementioned orchestral-like maneuvers of the math genius, conducts this piece with expert tempo, flawlessly shapes and guides the ensemble, and brilliantly interprets the work. And without question, the four members of this acting troupe, Anna Fagan, Viv Berger, Carey Van Hollen, and Daniel Basiletti, work together seamlessly, each bringing incomparable talent (professional level if I’m being honest) and nuanced life into their characters. What’s more, Proof presents us not only with mathematical wizardry but also mental illness – giving us yet another reason to pause about the mystifying brain. One might consider the psychological myth which inaccurately relates genius to insanity or madness. While some of the world’s most creative geniuses (Van Gogh, Edgar Allen Poe, Virginia Woolf, to name a few) have been diagnosed with illness, there is no scientific research which has unequivocally found any causal connection, but I digress. Here we have Catherine, a twenty-five-year old who shows signs of depression and possibly experiences hallucinations (or are they dreams about or yearnings for her recently deceased father?). She is grieving the loss of this brilliant but unstable man, Robert, a math genius of the highest caliber who was clearly ill to all who knew him, and showed signs of delusional thinking and other symptoms akin to schizophrenia. Why wouldn’t Catherine experience depression? – she worries that she is much like her father (or maybe that she’s not enough like him). While she possesses mathematical prowess, is she as extraordinary as he? Catherine’s plight is exacerbated by a domineering, but less gifted sister, Claire, who chose to leave her young sibling alone to deal with and care for their father (no mother is ever mentioned) during the height of his illness in his last years. And enter Hal, a student of Robert’s, who not only has a penchant and prowess for math (not to the level either of Robert or Catherine), but also a weakness for the bewildering Catherine. But the intricate convolutions of the human mind as well as both familial and romantic relationships are juxtaposed against the analytical but no less intricate convolutions of mathematics. In Proof as in all existence, there is conflict and constancy; volatility and calm; love and loss; hurt and healing; questions and (some) answers. And as always, life goes on, or it doesn’t. As for the cast, Anna Fagan is completely brilliant – I’ve rarely seen the caliber of acting in community theatre that rises to this level. Having seen her at Brookfield Theatre for the Arts’ Cat on a Hot Tin Roof, I knew then that she was something special. 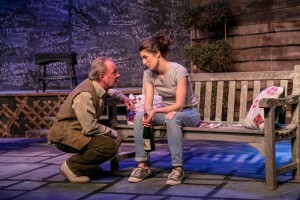 But as Catherine, she delivers a performance that is at times aching and at others, tender. She is both young and vulnerable as well as tough and beyond her years, and always engagingly authentic. Viv Berger as Robert is truly phenomenal – his portrayal of the tortured man gives me chills and his chemistry with Fagan is so completely genuine. I also loved him in TheatreWorks’ Animal Farm. Carey Van Hollen brings fiery life to the older sister – we’ve also seen Van Hollen as the Butcher’s Wife in Musicals at Richter’s Into the Woods, and she was equally fantastic. And Daniel Basiletti is terrific as the awkward fly in the proverbial ointment when he finds himself embroiled and trying to navigate the chaos of this twisted family dynamic. Also impressive is the set, static but affecting – the family back porch set against a chalkboard full of mathematical equations – some clear, some partially erased like the fading vestiges of Robert’s mind. It was the perfect backdrop for this moving piece. Kudos to Acaro for design and to his crew for pulling it off. Shout-outs to: Kathy Bolster as Stage Manager; James Hipp as Master Carpenter; Leif Smith as Lighting Designer; John Gromada as Sound Designer and for original music; John Bolster as Lighting & Sound Operator; Jenny Andress as Scenic Painter; Terri Gatten as Stage Crew; as well as the rest of the production staff. Run don’t walk to see TheatreWorks’ Proof. This is one you do not want to miss!